Lean Thinking: What is a Good Life? Plato, Socrates and Aristotle asked this question 2,500 years ago. Both eastern and western philosophy is largely the search for an answer. Clayton Christensen, author of The Innovator's Dilemma, Harvard professor, and classic hyper-achiever is raising the same question. In a recent interview, Dr. Christensen remarks that he is struck by how badly the lives of his fellow hyper-achievers have turned out. Messy divorces, estranged kids, and even, in some cases, fraud and imprisonment. Can Lean principles help to answer this most important question? I believe it can. Lean thinking is anchored in standards -- images of how things should be. Values are standards. Integrity entails adherence to one's personal standards. 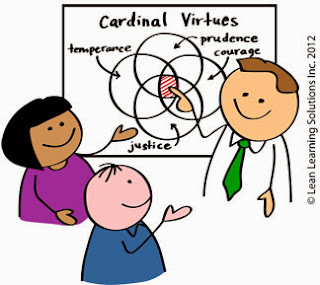 Those of you kind enough to read my books may have noted an emphasis on the Cardinal Virtues. Prudence, Temperance, Courage and Justice, are, of course, standards of behavior. Low-down, miserable, tricky, treacherous beings such as us have a hard time living up to them. But we have to try, and in doing so we partially succeed -- and that makes all difference. So what is a good life? I'd say a good life entails having good values, and trying to live up to them. Thanks Dr C. for raising the question. Just right and well done Pascal. This reminds me of why I enjoyed working with the Toyota people (at Toyoda Gosei) all those years from age 40 to 58. No BS, just simple and true principles and values. I've always been routed in values of course and now my lil' sis' has introduced me to Buddhism, a Wow and more!! Merci beaucoup for your post.